Learning how to do checks on where the foetus is positioned inside the mother's womb. 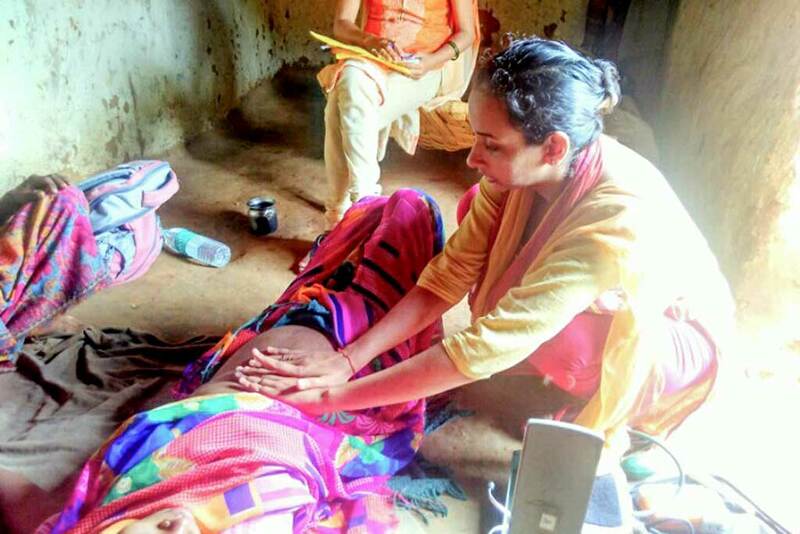 The next step in health care training for Amrita SeRVe’s Health Workers and Village Coordinators includes an emphasis on pregnant women and children in the villages. Twenty staff are in Varanasi to continue studies at the Ramakrishna Mission Home of Service. The classes started on July 25th and so far the ASeRVe staff have studied how to do checkups of pregnant women. This includes measurement of abdominal heights (for delivery), checking foetal heart sound, blood pressure checks, oedema checks, pallor checks, blood tests and more. Learning includes visiting nearby communities to put into practise with living patients what they have studied. The students have also done sessions on nutrition and anaemia for adolescent health. Studies continue until August 9th.